It has been noted that coffee was first discovered in Ethiopia. A goat herder saw his goats cavorting in a field and noticed that they were acting the “goat”. On further investigation he saw that they had eaten the fruit of small tree. He decided to taste the fruit himself. He found the fruit to be somewhat sweet but otherwise bald but also mildly refreshing. After a few minutes he started to feel a little “goaty” him self. This is thought to be the first use of the coffee bean!!! The first commercial cultivation of coffee is thought to have been in the Yemen district of Arabia in the fifteenth century. By the middle of the sixteenth century coffee had become popular in the Sudan, Syria, Egypt and Turkey. The Venetians traders brought coffee to Europe and from here it spread across the Atlantic to America. Coffee was a popular drink the America until the Boston Tea Party in 1773 when the palate of Americans changed to drinking tea. Modern day American now favour coffee again with many different coffee drinks available some of which are discussed in other sections of this site. 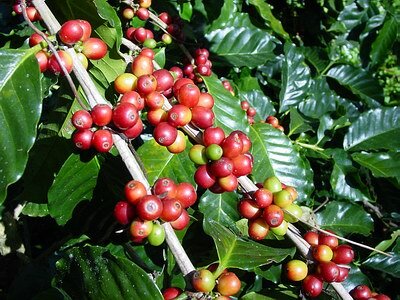 The trees that produce coffee are of the genus Coffea and belongs to the Rubiacea family. Even though there are more than fifty different varieties of coffee only two are commercially significant, Coffee Arabica and Coffee Robusta. Over 75% of the worlds production is Arabica. The coffee tree is an ever green shrub. It produces a fruit called a cherry which contains two coffee seeds. It is this seed that is harvested resulting in the coffee bean. Coffee is mainly produced in the tropical and sub-tropical belt in South and Central America, Asia and Africa. Brazil is the worlds largest producer of coffee followed by Columbia, the Ivory Coast and in forth place Indonesia. Tea was discovered by accident over 5000 years ago when a delicately flavoured liquid was created when leaves from the tea bush fell into some boiling water. It was originally used for medicinal purposes until the 1700’s when it became an every day drink. The is made from the top leaves and leaf buds of the camellia sinensis bush. It contains only have the caffeine of coffee and has further qualities such as aiding digestions and relaxing muscles. Tea is grown in over 25 different countries around the world. To be successful in growing tea a warm climate is required, with an average rain fall of at least 130cm per year. The tea bush also prefers acidic soil. All these variables have an implication to the quality and flavour of an individual tea. The main tea producing countries are China, East Africa, India, Indonesia and Sri Lanka. Out of all these countries, China is by far the oldest tea producing country known well for its production of green teas and other Oolongs. The tea from the area of East Africa brings a bright colour to different blends and is almost exclusively used for this purpose. India is the largest producer of tea in the world. Its famous for producing teas from Assam, which are strong and full bodies, and Darjeeling, which are light and delicate.